The UN Security Council has voted to lift most international sanctions imposed on Iraq during the Saddam Hussein era. The vote is intended as a recognition of the political progress made in Iraq. One resolution ends sanctions that were imposed to stop Iraq building nuclear, chemical or biological weapons. The fear that Saddam Hussein was developing weapons of mass destruction was the main reason cited for the 2003 invasion of Iraq. Sanctions were first imposed on Baghdad in 1991 after Iraq invaded Kuwait, though some relating to trade, investment and conventional weapons have been lifted since 2003. In a statement, the Security Council said it "recognises that the situation now existing in Iraq is significantly different from that which existed at the time of the adoption of resolution 661" in 1990. The council also voted to return control of Iraq's oil and natural gas revenue to the government on 30 June and to end all remaining activities of the oil-for-food programme, which helped ordinary Iraqis cope with sanctions. US Vice President Joe Biden, chairing the high-level meeting, noted that the number of violent attacks in Iraq had fallen and he said the people there had "flatly rejected the grim future offered by extremists". "Iraq is on the cusp of something remarkable - a stable, self-reliant nation," he said. But UN Secretary General Ban Ki Moon said Iraq must make efforts to agree a border with Kuwait and to agree on a dispute over war reparations if all sanctions were to be ended. Baghdad still pays 5% of revenues from its oil sales into a fund which pays reparations to Kuwait. Iraq's Foreign Minister Hoshyar Zebari said normalisation of relations with Kuwait would be a priority for the new Iraqi government. 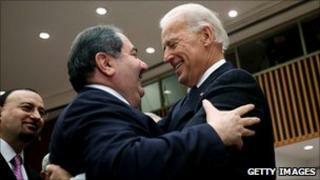 "I can say that the session today is the beginning of the end," Mr Zebari told Associated Press before the meeting. "Today Iraq will be liberated from all sanctions caused by wars and misdeeds of the former regime," he said. Analysis: Do economic sanctions work?